In 1924 J.J.P. Oud designed the facade of Café De Unie on Coolsingel. 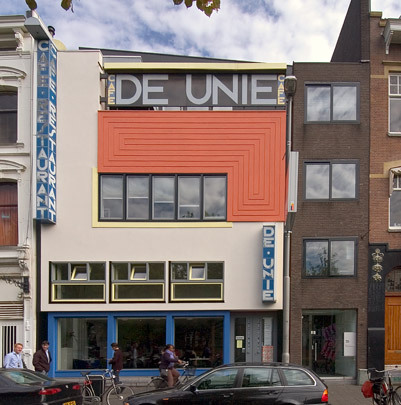 In the subdivision of its surface and use of primary colours De Unie is a typical product of De Stijl. The modernist facade with its bright colours and gaudy advertisements contrasted starkly with the existing buildings and was roundly criticized. Lettering and illuminated signs are used architecturally to fulfil the facade's most important function, namely to attract attention. The decorative and therefore apparently anti-functionalist facade really does seem the most appropriate solution. De Unie was destroyed during the 1940 bombardment, the facade being reconstructed at this new site in 1986.